The Kotobukiya Carnage ArtFX Statue will hit shelves in July. 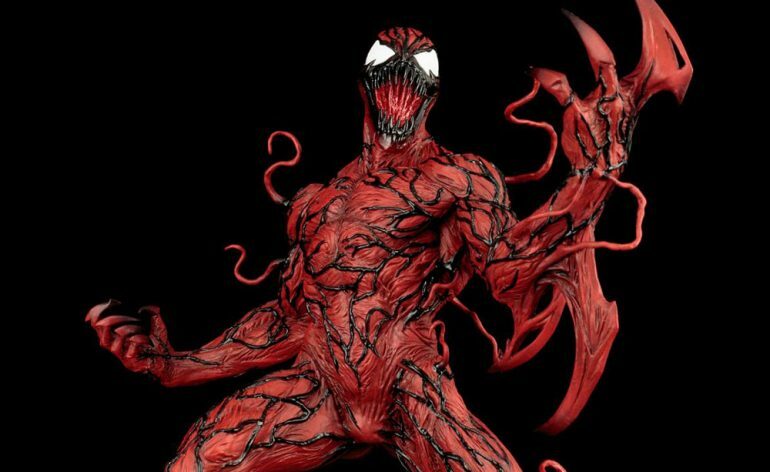 In June last year, Kotobukiya revealed a new line of ArtFX Spider-Man statues they were cooking up, which included the Amazing Spider-Man, Venom, Spider-Gwen, Agent Venom, Ultimate Spiderman, Spider-Man 2099, and Carnage. 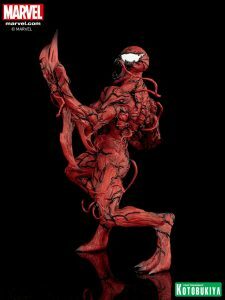 And since then, they’ve been slowly working their way through the statues, with Carnage now being the latest reveal. 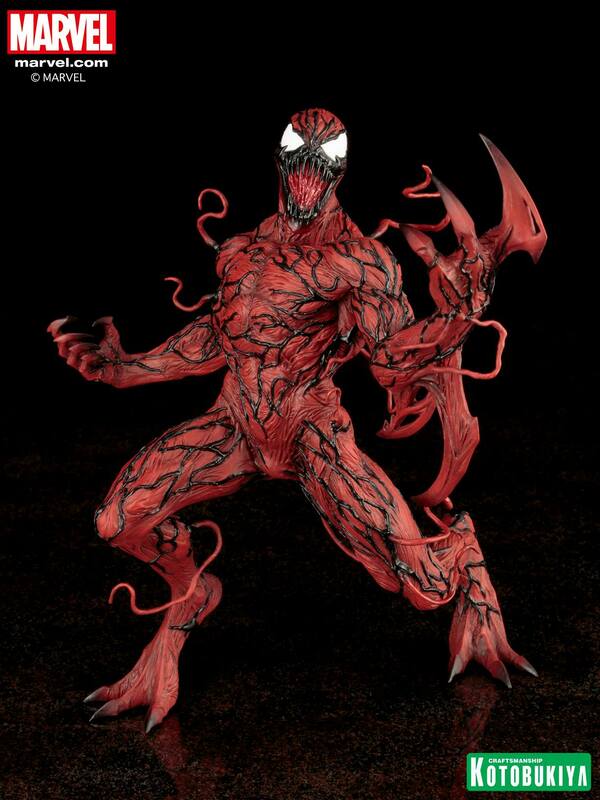 (I believe Venom and Spidey-2099 are the last two to reveal.) 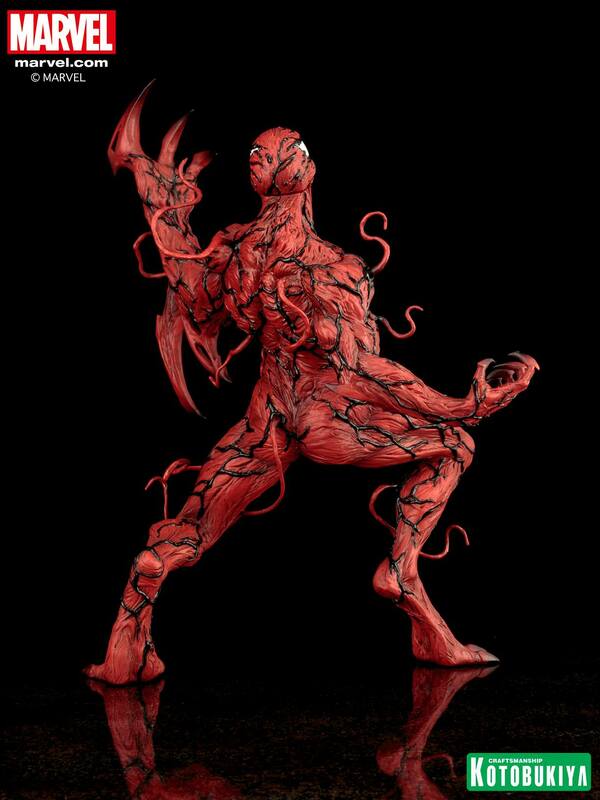 And Kotobukiya’s Carnage ArtFX statue looks appropriately epic and fitting for an iconic Spidey-villain. So, let’s take a look at what’s going on. How Tall Is the Carnage Statue? What is the State Made of? The statue is made from high-quality PVC and ABS plastic. Does the Statue Come With Any Accessories? 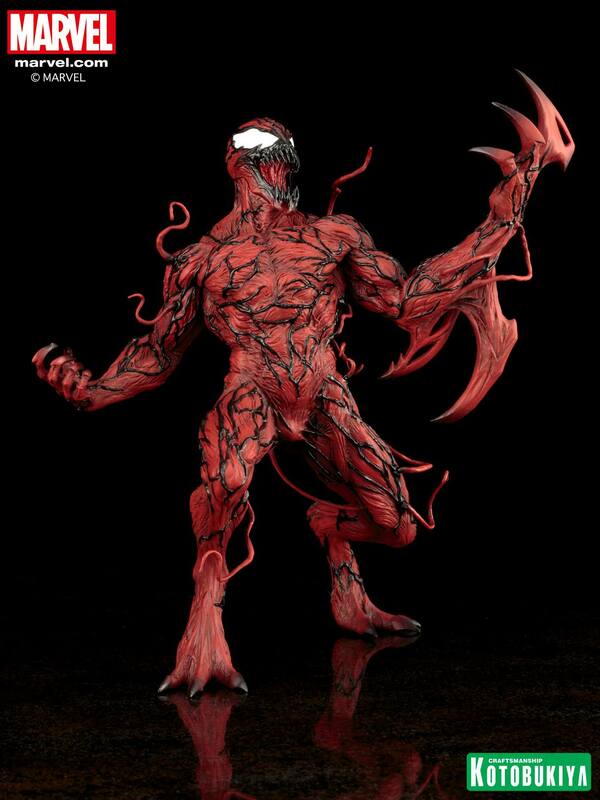 Like most of the other ArtFX statues, this one doesn’t have any accessories or interchangeable parts, but it will come with a display base, and have magnets in its feet to help stick more solidly to the base. How Much is the Carnage Statue, and Where Can I Order One? With the tentacles, incredible sculpt work, and dynamic pose, this Carnage statue is pretty epic, so it makes sense that he’d cost a little bit more. The statue is currently available for pre-order through Kotobukiya’s website for $79.99, or through Entertainment Earth, for $74.99. When Will the Statue Be Available? Kotobukiya is currently saying that the statue will be shipping out in July, 2017. 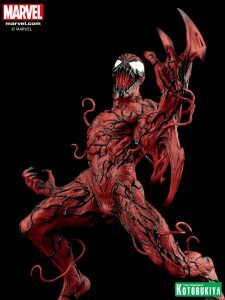 This carnage looks so real. Such a cool figure.